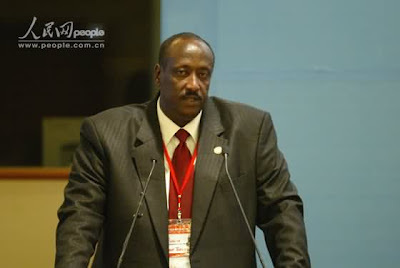 DOES SALIM SALEH HAVE A MICRO - FINANCE? Monday 31st January 2011, a lady called on me wanting a proposal document written for her so that she takes the same to Jumba the man who is standing for MP Busiro South Constituency on the NRM ticket. The lady gave the idea she wanted, and said she would collect the write up today morning. I was nice to her and took the piece of paper on which she had put the details of the proposal she wanted written. Today morning, she got a disappointment from me. I told her off. This is one of the living situations of the people we tell every other day the decay in NRM but they have failed to relise it. This is one woman who claims to be born again! The money is clearly a bribe and it is said that Jumba who resides in Bweya central Zone Kajjansi takes the prospect beneficiaries in his car and the meet Saleh. It is so unfortunate the decay we have to live with in the NRM leadership time. This guy Jumba can not win a Constituency which belongs to the Democratic party, but given the poverty levels into which NRM has put many Ugandans, he could get the constituency by using money. I cannot subscribe to NRM money. Let those who want to eat it, do but i for one, I was brought up in a real Christian family. My Late Father taught for years at Namutamba Teachers' College which the NRM has killed as has been the case with much of the infrastructure they found in place. I would be out of my senses to subscribe to anything NRM. The sooner the people of Uganda realized Uganda's problem with NRM leadership the better. The Bank of Uganda Governor, Mr Tumusiime Mutebile, called for investigations into the source of about Shs500 million stolen from Gen. Salim Saleh's daughter, describing its in-house storage as "suspicious." "Why should anyone keep that kind of money in the house? It means that that money is coming from a bad source. If that's not the case, why do they fear to keep it in the bank?" he asked. "As the Central Bank governor, I am now concerned and they should be investigated immediately." A spokesman for the police, to whom the governor passed the buck, however, said such an inquiry is unlikely because storage of such amount of money in a private residence is no "offence". "It only raises suspicion, but it is not an offence," said Mr Ibin Ssenkumbi, the Force's spokesperson for Kampala Metropolitan. Four days ago, Nakawa Chief Magistrate Deo Ssejjemba, convicted and handed down an eight-year jail sentence to housemaid Caroline Saturday, for stealing $200, 000 (Shs460m) and Euros 2,500 (Shs8m) from Ms Doreen Kiconco. Ms Kiconco is daughter of Gen. Saleh, a younger brother to President Museveni. The money, enough to pay salaries of some 2,340 primary school teachers in Uganda, was stolen from Royal Palm Estates residential apartment in Butabika, a city suburb, mid last month. 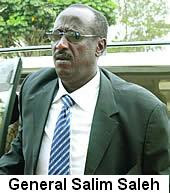 Gen. Saleh's wife Joviah, who closely followed the case, said she would not divulge the source of the money because the enquiry was in bad faith, even when the cash was not hers. "Write whatever you want, I don't care," she said. "If there's an investigation, they know where to find me - and I will tell them how I make my money." Saying journalists are following the case because her family name makes newspaper headlines and sells copies, Ms Saleh added: "Go and write your rubbish." Presidential candidate Kizza Besigye first raised the need to establish the source of the cash last Sunday while campaigning in Mpigi District. "The poor girl was just tempted by the piles of money that she saw. She picked just a portion and left a lot of it there," he said. "Instead of finding out where the money came from, they are prosecuting the young girl." President Museveni in October last year, suspended the former National Forestry Authority Executive Director, Mr Damien Akankwansa, saying authorities needed to investigate the source of Shs900m his wife Juliet allegedly stole from their bedroom. Mr Mutebile said it was odd Ms Saturday's trial and conviction was expedited within three weeks. "The girl who stole the money has since been convicted so I want the source of that money to be made public as well," he said, adding that even Shs1 million is "too much" an amount to keep in the house. Mr Mutebile recently called for immediate arrest of businessman, Mr Michael Ezra, for flashing before journalists what he said was $3 million (Shs6.3b) in $100 bills. Kampala:Presidential candidate Kizza Besigye yesterday called for investigations into the source of the nearly Shs500 million stolen from Ms Doreen Kiconco, daughter of Gen. Salim Saleh. 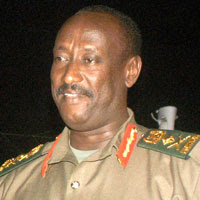 Gen. Saleh is President Museveni’s younger brother. Dr Besigye’s call came a day after Nakawa Chief Magistrate Deo Ssejjemba convicted and handed down an eight-year jail sentence to housemaid Caroline Saturday, for stealing $200,000 (Shs460m) and Euros2,500 (Shs8m). The money, enough to pay salaries of some 2,340 primary school teachers (each primary class teacher gets Shs200,000 per month), was stolen from Royal Palm Estates residential apartment in Butabika, a city suburb, mid last month. Gen. Saleh’s known telephone number was unavailable by press time and we were unable to reach his daughter. In October last year, President Museveni suspended the former executive director of the National Forestry Authority, Mr Damien Akankwansa, saying authorities needed to investigate the source of Shs900 million his wife Juliet allegedly stole from their bedroom. Dr Besigye has made nepotism by the ruling government part of his rallying call on Buganda to ditch Mr Museveni and embrace change. “The system now is such that money is absorbed from the poor and goes to a privileged class surrounding the President and this includes his relatives, friends, in-laws and power-brokers,” he said. Dr Besigye, a former political commissar of the Movement as the ruling NRM was called then, parted ways with President Museveni a decade ago after he authored a dossier detailing alleged digressions by the leaders from the original ideals that took them to the bush in 1981. This is his third attempt at the presidency. Mr Mirundi said employees at State House are a collection of all Ugandan tribes, adding that where relatives are employed, it is because they fought in the National Resistance Army bush war. He said: “Guerrilla warfare is normally fought by close relatives who can’t betray one another.” He added that poverty eradication is a personal war and all government does is provide an enabling environment for hardworking people to prosper. “Poverty isn’t an invention of President Museveni,” said Mr Mirundi. “Getting out of poverty is a personal obligation; poverty is like a lion which one should confront alone. The death of Gloria Kyasimire is very sad and unfortunate, however, the move the MP is taking looks like a strategy to 'loot' tax payers' money if I may call it so. When one is an MP in a sick country like Uganda, the chances of dying even when one would not die may be about 50%. 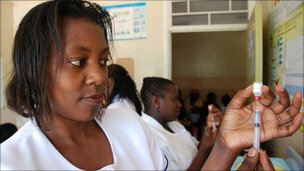 This is because of the circumstances the Health workers are in. Given that Gloria is with her creator, the good MP would do one thing, and that is to campaign against Museveni with the reason that if an MP could get his wife die the way she did, what about the other people who NRM "Museveni's" administration has turned to near paupers? The Doctors are among those who need to take children to good schools so that these can get the education to see them good professionals, but how many can survive on the merger pay by the NRM Government? It is time to take children back to school, where do these people get the millions to take children to good schools? If a nurse is given that little pay why shouldn't you expect to get a patient dying when she may have gone on an empty stomach? Let us be reasonable and use our heads right that way we shall find lasting solutions. The money the MP wants can do much more and may be he ia a beneficiary of shs 20m bribe from Government. A member of the East African Legislative Assembly, Bernard Mulengani, has sued Mulago Hospital and AAR health services over the death of his wife. Gloria Kyasimire died on February 7 at Mulago Hospital due to a blood mismatch shortly after a transfusion. Mulengani, who filed the suit in the High Court, is seeking compensation of sh542,018,700. The MP said the death of his wife was occasioned by the negligence of Mulago Hospital and AAR staff. He contends that AAR classified her blood group as B+ when she was O+. “AAR mixed it up the blood samples. They marked the blood sample of another patient with the name of my wife,” Mulengani said. Mulengani said between 2009 and 2010, the deceased got antenatal services from AAR. “In January 2010, she developed complications with her pregnancy and was admitted twice to Mulago. But one week after the second discharge, the same problem re-occurred, where upon she was re-admitted to Mulago. The doctors negligently carried out an operation, resulting into her death,” Mulengani said. He accused Mulago of failing to read records of previous births by the deceased in the same hospital and relied on the records of AAR. The MP also accused Mulago of failing to diagnose the cause of bleeding for a month and prematurely discharging his wife. Mulengani also accused the hospital of refusing to accept his offer to donate blood and failing to stock blood. Attempts to reach officials from AAR and Mulago Hospital were futile. Museveni may do whatever is possible and impossible to remain in power, but the reading is clean and clear: "TIME UP FOR MUSEVENI. HE IS MORE OF A LIABILITY TO THE COUNTRY NOW THAN AN ASSET." The struggles Museveni is making against what he has done for the country and what he can add on are those of any one who see's that he is on the disadvantaged side. As some NRM poor chaps prefer to call him "Nyini sente" (meaning owner of the money), this is false aggrandizement. Much as I can appreciate the manipulation by many illiterates, I would imagine that most of our schools do a good job, they don't train empty tins. We must get matters of our country right. What was done by past leaders is wrong, but to leave a repeat by people who have gone to school and benefitted from tax payer money is an abuse of our integrity. Surely, Museveni may make, but as former leaders came and left, our prayer is that the good Lord shows him exit without shedding blood by innocent Ugandans. Enough is enough. The National Resistance Movement has laid down what it calls a “zero graze” strategy for Buganda region, targeting ten groups. The strategy, according to documents seen and from conversations with some party mobilisers will cost the ruling party as much as Shs 20 billion. The Observer has learnt from NRM campaign strategists that President Museveni, who is now campaigning in Buganda, is ready to pull all the stops to ensure victory in the region, which has become unpredictable following bad blood between his government and Buganda Kingdom. “We would rather lose in any other region but not Buganda. Winning the general election without necessarily winning in Buganda would undermine our leadership. That is why we must beat the opposition here,” a campaign strategist told The Observer on condition of anonymity. The opposition, particularly the Inter-Party Cooperation (IPC), whose flag bearer is Dr Kizza Besigye, is also eyeing the Buganda region, hoping to capitalise on the relations between Mengo (the seat of Buganda Kingdom) and the central government being all but cordial. The IPC, through its Buganda-based pressure group, Ssuubi 2011, has promised to deliver the kingdom’s cherished federal system of government if elected. Other promises include the return of Buganda properties seized by the central government when kingdoms were abolished in 1967. 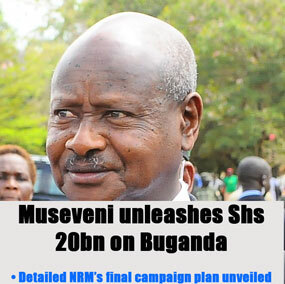 Notwithstanding this, the Museveni team appears convinced that its costly plan will deliver the votes. The sum will indeed raise eyebrows among critics who accuse the ruling party of using public resources to campaign for its presidential candidate. Only recently, the government wired Shs 6.5bn into the accounts of 321 MPs purportedly to help them “supervise government programmes”. This move has been widely criticized as an attempt to bribe the legislators. Moreover, it came shortly after the parliamentarians hurriedly passed a supplementary budget of Shs 600bn, with most of the money going to election related activities. According to the strategists we spoke to, NRM’s mobilisation is based at sub-county level to enable them reach the grassroots. Ten leagues have also been identified in every district and sub-county, including youth, women, people with disabilities, workers/entrepreneurs, elders, veterans, institutions, media and district executive committees. All these leagues are to be replicated in the sub-counties of each of the 23 districts in Buganda. This alone is to cost the NRM Shs16 billion. “Our strategy is for each and every league to zero graze on its target group. The executive committee has been treated as a league in order to coordinate and oversee the mobilisation exercise,” the strategist disclosed. NRM regional leaders are expected to meet with different categories of people, including opinion leaders, traditional leaders, spiritual leaders, veterans, NRM cadres, and former RC/LC leaders. They will address public rallies at sub-county level and participate in radio talk-shows and phone in to programmes. The general mobilisation is to act as a curtain raiser in the communities in preparation for the candidate’s campaign rallies, and for follow-up purposes thereafter. This grand plan, sources have told us, is expected to extinguish the negativity generated by, among others, the controversial cultural leaders bill in Buganda. Fearing the worst, the 50 MPs from Buganda belonging to NRM, and some ministers, have rejected the bill. President Museveni, however, insists the bill has been brought in good faith to keep the Kabaka and other cultural leaders out of politics. But Buganda maintains its stance against it, saying it aims to weaken heir king. For the NRM candidate to navigate this controversy without suffering a political backlash here, the region has been split into five sub-regions: East Buganda, West Buganda, South Buganda, North Buganda and Central Buganda. Each sub-region will have a chairperson, vice chairperson, secretary, treasurer and mobiliser. Contestants in the local government race will not be appointed chairpersons so that those appointed “may be fully committed to the presidential/national campaign”. The sub-regions have been assigned heads: East Buganda, which includes Mukono, Buikwe, Buvuma and Kayunga districts, will be headed by Hajji Hussein Mayanja Njuki. West Buganda (Mubende, Mityana, Kiboga and Kyankwanzi districts) is to be headed by Ndawula Kaweesi, and South Buganda (Masaka, Rakai, Kalangala, Ssembabule, Lyantonde, Kalungu, Bukomansimbi and Lwengo districts) will be headed by Kityamuweesi Musuubire. North Buganda (Luweero, Nakaseke and Nakasongola districts) is headed by Ssempala Kigozi and Central Buganda (Mpigi, Wakiso, Gomba and Butambala districts), by Mutebi Kityo. Hajji Abdul Naduli, NRM vice-chairperson for Buganda, heads the entire team of sub-region heads. The budget has been broken down as follows: youth league: Shs 7m; women league: Shs 5m; veterans: Shs 3m; workers: Shs3m; disabled: Shs 3m; entrepreneurs: Shs3m; elders: Shs 3m; institutions: Shs 3m; general mobilisation (including media): Shs 7m; and executive committee: Shs7m. The total sum per sub-county is Shs 44 million. The overall total for all 23 districts in Buganda is Shs 16 billion. An additional 20 percent of the sub-regional structures will be Shs 3.2 billion for regional offices and additional Shs1.6 billion for all the five sub-regional offices combined. Administrator-Shs 800,000, two secretaries-Shs 800,000 (Shs 400,000 each), receptionist-Shs 200,000, office messenger-Shs 200,000, office cleaner-Shs 200,000, accountant-Shs 600,000. Auditor-Shs 600,000, Cashier-Shs 400,000, two drivers – Shs 400,000 (Shs 200,000 each), furniture - Shs2 million, carpets-Shs 400,000, curtains-Shs 800,000, 3 computers-Shs 10.5million (Shs 3.5m each), public address system-Shs30m, 2 motor vehicles, fuel,maintenance-Shs 80m. I think it is a fact that Engineer Badru Kiggundu cannot stop President Museveni in any of his excesses, be it the way he uses whatever resources at his disposal. Currently, the inflation is already being realised simply because of NRM money. The strategy to sort the problem is at the hands of Ugandans, they either let the country decay on with corruption and lack of direction or see a replacement for Museveni. Surely, things cannot go on as they are for long. a change is the way to go. The public also expects clarification and tightening of the role of security agencies, use of thumb print by party agents in the authentication of Results Declaration Forms and use of transparent mechanisms for transmission of results from the polling stations to the sub-county onward to the district tallying centres. “The Electoral Commission’s issuance of clear guidelines for the media and political parties on the declaration of provisional results is paramount” Dr Zac Niringiye, who chairs the IRCU’s task force for peace, conflict resolution and transformation, said in a statement. He said this after a meeting of religious leaders with Police chief Kale Kayihura in Kampala on Friday. Police displayed four uniforms to be used in the general election. But Dr Niringiye said the public is concerned about the many uniforms the police are using. He said this could be abused by wrong elements during elections. IS IT A SURPRISE IF SHS 3.7BN IS NOT SEEN? What the people of Uganda have to know is that much of this money is a loan to the country which has to be paid back. At least Shs3.7 billion meant for the first phase of the Northern Uganda Social Action Fund (Nusaf)to fight poverty and improve standards of living in northern Uganda has not been accounted for as the second phase unfolds this year. Dr Robert Limlim, the director of Nusaf II said Karamoja sub- region led in misappropriation of funds with up to Shs1.7 billion still unaccounted for although investigations to apprehend those who misused the money were still ongoing. Dr Limlim said due to discrepancies in spending, several beneficiaries and officials did not return accountability forms to the management unit as required. “Slow but surely we are getting down to arrest those implicated in the fraudulent use of the funds,” Dr Limlim said while briefing district information officers, district Nusaf desk officers and journalists at a conference held in Lira on Friday. He said chief administrative officers of the beneficiary districts have been tasked to categorise the unaccounted for and unfinished projects and forward the list to the Nusaf head quarters for action. The State Minister for Information, Ms Kabakumba Masiko, however, blamed slow process of prosecuting culprits on judicial officials, whom she accused of tossing some of the cases. Ms Masiko, however, said Nusaf phase II would be free of corruption and embezzlement, saying those implicated in phase I have been left out. WHERE DID SHS 20M BRIBE COME FROM? Of course any body with some common sense cannot be taken for a ride that shs 20m paid into MP's accounts was meant for Government business. Since when did Government start taxing monies meant to do its business. Those taking us for a ride think that we are silly; we unfortunately are not. You cannot tax 30% of such money and then go around telling us that it is for NAADS business. I pity my O B at St. Mary's College Kisubi, Hon. Ssekandi, for whatever good he may have done in his career life, he is likely to be remembered for the role he is about to do, to see that the Bill on Traditional Leaders is passed. I thank God, because I am above such. WHERE DID THE SHS 20M BRIBE COME FROM? A row is brewing between Ministry of Finance and Parliament over the source of the Shs20 million ‘bribe’ that was given to each MP ahead of the February 18 polls. Even as nobody is willing to own-up the Shs20m ‘bribe’, the Deputy Secretary to the Treasury, Mr Keith Muhakanizi, and the Director Budget, Mr Patrick Ocailap, have added a new twist to the scandal—asking authorities in Parliament to “tell the truth”. But even as the Ministry of Finance passes the buck, the Parliamentary Commission says the Treasury must explain why they gave the money to MPs yet each year they get Shs10m under the Constitutional Development Fund. Whereas this claim of ignorance and blame game might look comic, the opposition say it is a sign of a bigger malaise in government—dishonesty and lack of an accountability system. But sources close to the Parliamentary Commission who asked for anonymity in order to speak freely, told Saturday Monitor that the idea was hatched several Thursdays back by members of the Parliamentary Commission linked to the ruling NRM party. The commission is the custodian of MPs’ welfare—and draws membership both from the NRM and the opposition. According to the source, the idea was then sold to the Finance Minister, Ms Syda Bbumba, who forwarded it to State House for endorsement. The President reportedly okayed the deal, largely because he was convinced a number of his NRM legislators needed the financial hand-out to ably defend their seats in the February 18 polls. To camouflage the “grand deal”, it was agreed that opposition MPs share the “loot” and help silence questions on Parliament’s role in failing to block the Shs6.5 billion deal as required under the Budget Act, 2001. According to the source, with many current NRM MPs having lost the primaries in a chaotic election last August, and therefore not qualifying for party facilitation, this deal would help line their pockets as they run as independents. The NRM has given each of its flag bearers Shs20m, while those vying for Women MPs slots have bagged Shs25 million each. “It was a difficult decision, but upon realising that majority of the NRM independents who lost in the primaries were to miss out on the Shs20 million given to flag-bearers, they approached State House to help them in their campaigns. In other words, the decision to pay MPs came from above and Ministry of Finance had to obey,” said the source. And the Parliamentary Commission has not been spared either. Some members are furious that they were kept in the dark about the deal. Whereas Capt. Guma Gumisiriza (Ibanda North) and Ms Justine Kasule Lumumba (Bugiri Woman) are said to have been in the know, the likes of Kaberamaido Woman MP Florence Ibbi Ekwau and Denis Hamson Obua (Youth North) had no clue about what was happening. Ms Bbumba has since asked MPs to take the money even as she warned that government taps were running dry, six months to the end of the financial year. This means that various ministries and agencies are unlikely to execute the planned activities due to lack of funds. In trying to salvage taxpayers’ money, civil society groups this week gave MPs a nine-day ultimatum to return the money or face legal action. On Thursday, just nine opposition MPs heeded that call—in a House of more than 300. 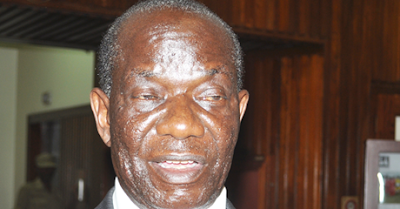 Speaker Edward Ssekandi has defied public anger against rushing the cultural leaders Bill and summoned Parliament on Tuesday to have the proposed law passed before elections on February 18, in fulfillment of President Museveni’s directive. On January 6, President Museveni met Mr Ssekandi at State House Entebbe before meeting the NRM Parliamentary Caucus where it was reportedly agreed to have the Bill debated and passed before the elections. The directive later forced the joint committee to hold impromptu public hearings where the government tabled key amendments to the Bill. Out of 21 Clauses of the Bill, the government has since deleted 15 among them the proposal of handing government the power to withdraw recognition of a traditional leader, who engages in politics, the idea of creating an offence when a person compels another to pay allegiance to a traditional leader and the idea of punishing a traditional leader who provides a platform for members of a political party to discuss politics. Tabled on December 17, 2009, the Bill, which seeks to bar traditional and cultural leaders from engaging in partisan politics, kicked off a storm with most vocal protests from Buganda Kingdom. Buganda boycotted the committee proceedings after the government refused to share the amendments with the Kingdom for effective discussion. Most of the MPs who spoke to Sunday Monitor but requested for anonymity in order to speak freely said they will not attend the proceedings on the Bill, not because they are against the passing of the Bill but they will be busy campaigning. “Unless they wanted us to fail, I don’t see why they cannot wait and we handle that Bill after the elections. They want to make us busy as our competitors are busy campaigning. In any case, some of us who come from Buganda and the people are against the Bill and we don’t want the President to say we defied him. The best way is to stay away and campaign,” an MP from Buganda said. Buganda Caucus has since passed a bi-partisan resolution rejecting the Bill as unconstitutional and called for its withdrawal after government tabled amendments that substantially changed the original text. Buganda loyalists, human rights activists and legal minds have since vowed to sue the government if the Bill is passed into law. Good governance has 8 major characteristics. It is participatory, consensus oriented, accountable, transparent, responsive, effective and efficient, equitable and inclusive and follows the rule of law. It assures that corruption is minimized, the views of minorities are taken into account and that the voices of the most vulnerable in society are heard in decision-making. (OECD, 2001). Effectiveness and efficiency: Good governance means that processes and institutions produce results that meet the needs of society while making the best use of resources at their disposal. The concept of efficiency in the context of good governance also covers the sustainable use of natural resources and the protection of the environment. Accountability is a key requirement of good governance. Not only governmental institutions but also the private sector and civil society organizations must be accountable to the public and to their institutional stakeholders. Who is accountable to whom varies depending on whether decisions or actions taken are internal or external to an organization or institution. In general an organization or an institution is accountable to those who will be affected by its decisions or actions. Accountability cannot be enforced without transparency and the rule of law. Consensus oriented: There are several actors and as many view points in a given society. Good governance requires mediation of the different interests in society to reach a broad consensus in society on what is in the best interest of the whole community and how this can be achieved. It also requires a broad and long-term perspective on what is needed for sustainable human development and how to achieve the goals of such development. This can only result from an understanding of the historical, cultural and social contexts of a given society or community. Equity and inclusiveness: A society’s well being depends on ensuring that all its members feel that they have a stake in it and do not feel excluded from the mainstream of society. This requires all groups, but particularly the most vulnerable, have opportunities to improve or maintain their well being. Rule of Law: Good governance requires fair legal frameworks that are enforced impartially. It also requires full protection of human rights, particularly those of minorities. Impartial enforcement of laws requires an independent judiciary and an impartial and incorruptible police force. * Governance is a conceptual approach that, when fully elaborated, can frame a comparative analysis of macro-politics. * Governance concerns "big" questions of a "constitutional" nature that establish the rules of political conduct. * Governance involves creative intervention by political actors to change structures that inhibit the expression of human potential. * Governance is a rational concept, emphasising the nature of interactions between state and social actors, and among social actors themselves. * Governance refers to particular types of relationships among political actors: that is, those which are socially sanctioned rather than arbitrary. It started with President Museveni nominating Kiggundu and Commissioners for another term. People raised concerns, but Museveni kept to his guns and Kiggundu is in control. There was registration of new voters and what people did not take seriously is the opening of new areas for registration among these the City Square. Now we see Voter cards are not being delivered and it is as if the Voter cards and National ID project were twin projects. We learnt that Kiggundu had discovered about 1 million ghosts and he alleges to have removed them. No prosecution and no body knows how he cam e across such ghosts no did he get the public to know them. He now says that registers are to be displayed 2 weeks to polls. Ugandans ought to scrutinize these registers because we are fed up of being taken for fools simply because NRM wants to remain in power. We are now aware that youths are being recruited and the purpose why the polls are expected to be violent is a concern by many. And now how can Ugandans be sure that the register Kiggundu is to display will carry th same names as that of 18th February? Why don't the Uganda Voters decide to boycott the elections until what is wrongly done is rectified. We need to be more vigilant. Enough is enough, taking people for a ride yet when they are in need of a change. President Museveni has been in for more than two decades, those in sound mind know that the President of Uganda should be in office for a maximum of 10 consecutive years. Who has brains and cannot see that? Given what we are going through regarding manipulation by NRM and President Museveni not wishing to leave power, I stand out to advocate for a strategy that can see Buganda as a a region break away from Uganda's marriage for convenience which is proving a liability for the people in Buganda given that NRM leadership is at liberty to use what is at its disposal to see continued bad governance of the country as we look on. Many of us see avenues that can see Buganda which has existed for not less than 800 years regain its glory. The way Southern Sudan is doing it. This is not for selfish reasons, but when we get leaders who think that they are leading fools, then we are forced to do things as wise people would. A lot is going on during NRM time of administration which is unacceptable. Much as we still have so many people who are illiterate or semi literate we shall not be taken for a ride all the time. A man comes to be in office for 4 years and he now wants to be in office for 30 years! And even then he keeps dictating because he is at liberty to use the army and other arms of Government. He is at liberty to get whatever money he wants to do missions which are not a priority, we are looking on as the currency; Uganda Shilling depreciates. We know that the awarding of district status is a mandate of some authority, he is having his own yardstick to give any area that is asking for a district to have it! Surely, has Uganda sank so low? W deserve better. Merely because Museveni wants to remain in power is no passport to have policies which are to sink the country further. However, I think no Muganda or person in Buganda worth his salt can wish Kabaka Mutebi to be President of a Federal Republic of Buganda. So, just keep him out of this proposal as proposed by myself. History is said to repeat itself, but there is no law that forces us to make history repeat itself, especially when such a repeat triggers off a well-known sequence. At least that is the queasy feeling I got when I heard it repeated that Sabasajja Ronald Muwenda Mutebi II, Kabaka of Buganda, should not hesitate to try for President of the Republic of Uganda. Over five years ago, a leading NRM light who wanted Kabaka Mutebi to steer clear of competitive politics bluntly advised that if he wanted political power, all positions right from LC I to state house were contestable. Nearly fifty years ago, Baganda traditionalists who were genuinely convinced that the Kabaka had to be 'Citizen Number 1' even in a united Uganda, joined forces with clever opportunists to endorse Kabaka Edward Frederick Muteesa II of Buganda as President of Uganda. The late journalist Colin Legum cheekily but appropriately described President Muteesa as 'The Royal Republican', which however sent no warning into the minds of local praise-worshippers. The contradiction was in a hereditary ruler taking charge of a constitutional republican democracy. In his own 'Desecration of My kingdom', Sir Edward Muteesa expressed his "first twinge of foreboding "when Obote rather than he presided over the flag-raising event that marked Uganda's independence in 1962. He saw in it an unfair shift in prerogatives, correctly noting that it is his ancestors (rather than Obote's) whose activities had shaped modern Uganda. Sir Edward noted that in relation to the rest of Uganda, he and his subjects were to be considered 'primus inter pares'; first among equals. A few years later, the late Dr. Naphtali Akena Adoko was to write in his 'The Uganda Crisis' that " No dead man has the right to rule the living, either directly through his own ghost or indirectly through heirs". He was talking about kings in direct reference to President Muteesa who had just been ousted in a putsch. This was heralded by the UPC as 'The 1966 Revolution', while others called it a crisis. Two weeks ago, a Luganda daily newspaper 'Kamunye' published a front-page image of 'Colonel Ronald Muwenda Mutebi' in battle fatigues, sending our millions of praise-worshippers into a frenzy. Don't waste your time lecturing that the photo was computer-generated. The message that the Kabaka deserved to be a Colonel at the very lowest was more important. So zealous were the praise-worshippers that they begged the Creator to turn the imagination into reality. One youth told me with a straight face that the NRM/NRA had denied the king his true military rank for a very long time but that the 'unstoppable truth' was finally coming out! And just a week ago, President Museveni again repeated his favourite exhortation to traditional rulers to steer clear of partisan politics lest they burn their fingers. The most sensational scoop of the event, which was Omukama Solomon Iguru's coronation anniversary in Hoima, appeared in 'The Observer'. The bi-weekly quoted the President as (literally) swearing to behead Kabaka Ronald Mutebi for involving himself in anti-NRM politics. 'The Observer' is still apologising over this scoop, but anti-NRM activists are letting everybody know how 'Observer' editors were threatened with death and other sinister reprisals if they did not declare their original story to be lies. The impression circulating on the internet is that the Kabaka of Buganda is facing the direst tribulations in the kingdom's history and that Obote's 1966 coup was a tea party by comparison. Someone somewhere is psychologically preparing ordinary people to expect the worst from their own elected government! Finally, some top Baganda politicians are now openly putting Buganda up for political investors to buy political shares, which they will cash after the 2011 elections. The brokers and touts simply ask the suitors what they promise for the kingdom in exchange for Buganda's hand in marriage. It is likely to be a very polyandrous marriage; very many husbands for a single wife! But at the Eleventh Hour, all these suitors are likely to be informed that the only safe guarantee for THE NAMUNSWA is for THE NAMUNSWA to occupy the country's most powerful office, a suggestion even their opportunistic livers and spleens will find hard to swallow. But the die will have been cast by then and the only questions will be whether the lion can be safely denied his share and who the lion actually is. Is there any way we can save Kabaka Ronald Muwenda Mutebi II from His Excellency Ronald Muwenda Mutebi, President of the Republic of Uganda? as a mark of choice. the voter will fold the ballot paper once, lengthwise, and then put it into the ballot box. during the issuance of ballot papers. The 12LED lamp provide many hours of bright light. The lamp comes with a rechargeable battery that can be charged with the included solar panel. The rechargeable battery in the lamp will last up to 2 years depending on how the lamp is used. Replacement batteries and replacement LEDs are available. The battery will fully recharge in 5.5 hours, if the panel is placed in direct sunlight. Please keep the lamp inside when charging. The three most common types of solar cookers are box cookers, curved concentrators (parabolics) and panel cookers. Hundreds — if not thousands — of variations on these basic types exist. Additionally, several large-scale solar cooking systems have been developed to meet the needs of institutions worldwide. Box-type cookers are another group of old but popular type of solar cookers. The very first design of box-type cooker was probably that of Nicholas-de-Saussure (1740-1799). It was simply an insulated box with glazing; this design forms the basis of all the present designs of box-type cookers including Richard Wareham’s (1995) Sunstove. The box cookers presented here are classified on the basis of presence or absence of reflectors, i.e., those without or with mirrors boosters. The cookers of the second category are further divided into five groups. People use solar cookers primarily to cook food and pasteurize water, although additional uses are continually being developed. Numerous factors including access to materials, availability of traditional cooking fuels, climate, food preferences, cultural factors, and technical capabilities, affect people's approach to solar cooking. These principles are presented in general terms so that they are applicable to a wide variety of design problems. Whether the need is to cook food, pasteurize water, or dry fish or grain; the basic principles of solar, heat transfer, and materials apply. We look forward to the application of a wide variety of materials and techniques as people make direct use of the sun's energy. 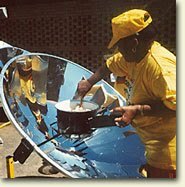 The basic purpose of a solar box cooker is to heat things up - cook food, purify water, and sterilize instruments - to mention a few. 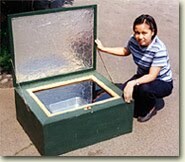 A solar box cooks because the interior of the box is heated by the energy of the sun. Sunlight, both direct and reflected, enters the solar box through the glass or plastic top. It turns to heat energy when it is absorbed by the dark absorber plate and cooking pots. This heat input causes the temperature inside of the solar box cooker to rise until the heat loss of the cooker is equal to the solar heat gain. Temperatures sufficient for cooking food and pasteurizing water are easily achieved. This effect results in the heating of enclosed spaces into which the sun shines through a transparent material such as glass or plastic. Visible light easily passes through the glass and is absorbed and reflected by materials within the enclosed space. The light energy that is absorbed by dark pots and the dark absorber plate underneath the pots is converted into longer wavelength heat energy and radiates from the interior materials. Most of this radiant energy, because it is of a longer wavelength, cannot pass back out through the glass and is therefore trapped within the enclosed space. The reflected light is either absorbed by other materials within the space or, because it doesn't change wavelength, passes back out through the glass. Critical to solar cooker performance, the heat that is collected by the dark metal absorber plate and pots is conducted through those materials to heat and cook the food. The more directly the glass faces the sun, the greater the solar heat gain. Although the glass is the same size on box 1 and box 2, more sun shines through the glass on box 2 because it faces the sun more directly. Note that box 2 also has more wall area through which to lose heat. Single or multiple reflectors bounce additional sunlight through the glass and into the solar box. This additional input of solar energy results in higher cooker temperatures. The Second Law of Thermodynamics states that heat always travels from high to low energy. Heat within a solar box cooker is lost in three fundamental ways: Conduction, Radiation, and Convection. The handle of a metal pan on a stove or fire becomes hot through the transfer of heat from the fire through the materials of the pan, to the materials of the handle. In the same way, heat within a solar box is lost when it travels through the molecules of tin foil, glass, cardboard, air, and insulation, to the air outside of the box. The solar heated absorber plate conducts heat to the bottoms of the pots. To prevent loss of this heat via conduction through the bottom of the cooker, the absorber plate is raised from the bottom using small insulating spacers as in figure 6. Things that are warm or hot -- fires, stoves, or pots and food within a solar box cooker -- give off heat waves, or radiate heat to their surroundings. These heat waves are radiated from warm objects through air or space. Most of the radiant heat given off by the warm pots within a solar box is reflected from the foil and glass back to the pots and bottom tray. Although the transparent glazings do trap most of the radiant heat, some does escape directly through the glazing. Glass traps radiant heat better than most plastics. Molecules of air move in and out of the box through cracks. They convect. Heated air molecules within a solar box escape, primarily through the cracks around the top lid, a side "oven door" opening, or construction imperfections. Cooler air from outside the box also enters through these openings. As the density and weight of the materials within the insulated shell of a solar box cooker increase, the capacity of the box to hold heat increases. The interior of a box including heavy materials such as rocks, bricks, heavy pans, water, or heavy foods will take longer to heat up because of this additional heat storage capacity. The incoming energy is stored as heat in these heavy materials, slowing down the heating of the air in the box. These dense materials, charged with heat, will radiate that heat within the box, keeping it warm for a longer period at the day's end. In order for the box to reach interior temperatures high enough for cooking, the walls and the bottom of the box must have good insulation (heat retention) value. Good insulating materials include: aluminum foil (radiant reflector), feathers (down feathers are best), spun fiberglass, rockwool, cellulose, rice hulls, wool, straw, and crumpled newspaper. Curved concentrator cookers, or "parabolics," cook fast at high temperatures, but require frequent adjustment and supervision for safe operation. Several hundred thousand exist, mainly in China. They are especially useful for large-scale institutional cooking. Panel cookers incorporate elements of box and curved concentrator cookers. They are simple and relatively inexpensive to buy or produce. Solar Cookers International's "CooKit" is the most widely used combination cooker. The opposition can decide to boycott the General Elections when they are convinced that things are not well. If Government deliberately refuses to print Voter cards for millions of people, it is not wrong for people who are now used to a cheating NRM to assume that this is a strategy to cheat. The reading on the wall is clear, 25 years in power, President Museveni is just trying to see that he remains in power, otherwise in eyes of people who think that this country can have a better future as currently there is no future worth mentioning, change is the way to go. Meseveni initially promised to be in power for 4 years, today, 25th January, it is exactly 25 years since his army captured power and has sine used tactics and tricks together with the army to see him continue as President, so when people come and complain that certain things are not right, they have a point. While people should be longing for a change, funny opinion polls show that he has over 60 which cannot be under normal circumstances. The way leaders cling to power shows how many have failed to learn from history. Just on Tuesday 25th January 2011 I saw with my eyes youthful boys and girls who were from training at Bweya 8miles Entebbe Highway. Why does the NRM Government keep training such youths who are the most disadvantaged during its leadership? The formula used in getting these youth is not clear either. This is how dictators stay in power. They use machinery to threaten people, otherwise if Government was not having hidden agenda why would they expect people to be not to e peaceful? They now know that some unknown people may appear on polling stations and this type of youth should be ready to deal with them. Yes, because we are under developed and dominated by dictators, we at times have no choice but to resort to prayer. THE High Court in Kampala has dismissed a case filed by the Forum for Democratic Change (FDC) seeking to compel the Electoral Commission (EC) to issue voting cards to about four million newly registered voters before next month’s general elections. Court presided over by Justice Eldad Mwangushya dismissed the case on grounds that a voter’s card is not the only document that can be used to identify a voter. “My understanding of these provisions regarding issuance and introduction of voters’ cards is that a voter’s card is one of the instruments by which a voter can be identified at a polling station but is not the only instrument,” Mwangushya said. The FDC on December 22, 2010 petitioned the court to compel the EC to issue the cards before the February 18 elections. The EC had announced in October last year that it would not issue the cards since the internal affairs ministry was about to issue national identity cards. Through its lawyer, Wandera Ogalo, FDC argued that the EC’s decision to allow the four million people to vote without cards would lead to abuse of the electoral process. If the court had ruled in favour of the FDC, it would have meant delaying the elections to enable the EC print and issue the cards to the millions of new voters who registered last year. The case arose on December 22 last year after FDC filed an application for a judicial review against the EC’s decision. But in his ruling, the judge agreed with the EC that any person, whose name appears in the register, would be allowed to vote. He dismissed the claim by FDC vice-president Salaam Musumba that the four million voters risked being disenfranchised. When court heard the application on January 12, Ogalo submitted that according to Section 35 of the amended Presidential Elections Act 2010, it is a mandatory duty for EC to print and issue voters’ cards. But EC lawyer Christine Kahwa argued that even without a voter’s card, a voter can still be identified on the polling day using the new photographic register, as opposed to the old text register. The judge said FDC’s fears were based on speculation and that all stakeholders were duty-bound to ensure that vices like ballot stuffing are avoided. “I do not understand how this would disenfranchise voters who have not been issued with voters’ cards. They will be allowed to vote,” the judge said. He, however, added the matters raised by FDC should be considered to contribute to the better management of the polls. Speaking after the ruling, Ogalo expressed dismay at the court’s decision but ruled out an appeal. Lukyamuzi said the court should have considered the imperfections that have marred the previous polls. With barely three weeks left, opposition leaders yesterday demanded next month’s elections be postponed until voters’ cards are issued to more than four million newly-registered voters to avert a possible crisis. The government, however, responded that “it is not possible to postpone the elections because voters’ cards are not a pre-condition to voting”. Information Minister Kabakumba Masiko told this newspaper last evening that the EC drew a calendar of the election roadmap which is being adhered to. “We have a clean and credible register and we as government are doing everything possible that the elections are free and fair,” said Ms Masiko, who accused the opposition of wanting to delay the elections and plunge the country into chaos. The call for rescheduling was made during a joint press conference held at Kampala’s Christ the King Church premises, following a meeting earlier in the day with the Electoral Commission, at which the leaders warned that the “voters register is fatally flawed”. There are 13.9 million voters according to the provisional register released by the EC which figure the opposition and other stakeholders have questioned for a country where 56 per cent of its 32 million people are recorded as being younger than 18, the threshold of adult voting age. Dr Abed Bwanika of PDP, Mr Olara Otunnu of UPC, People’s Progressive Party candidate, Jaberi Bidandi Ssali and an Independent Sam Walter Lubega convened the press conference. They also proposed an emergency summit to be attended by all eight presidential candidates, religious leaders and civil society organisations before polling day to find a way forward. “We are laying the case that if we go to the elections, will it make sense to the electorate? The summit will give all stakeholders an option. However, the best option we see now is to stretch this election so that the EC has good time to provide remedies,” said Dr Bwanika. The opposition leaders say absence of voters’ cards, proliferation of ghost polling stations, a bloated voters register, multiple registration, and with foreigners and under age voters preparing to participate, the elections won’t be free and fair. Calls for a postponement come weeks after the FDC sued the electoral body, seeking a declaration compelling it to issue cards to newly-registered voters. EC Secretary Sam Rwakoojo has contended that Section 35(3) of the amended Presidential Elections Act, 2010, provides for voting without the voters cards as long as one is able to prove to the polling officer or assistant that his or her name and photograph appear in the register. Hearing of the case continues. In the meantime, FDC leader Kizza Besigye, and his compatriots in the opposition vow they will announce their own version of the results. The opposition, whose repeated demands for broad electoral reforms were ignored by government, is adamant that the EC is not impartial in the matter and cannot be trusted to return an impeccable result. Dr Besigye has unsuccessfully contested the last two elections which the Supreme Court found were not conducted in accordance with the law, were marred by irregularities, including rigging, but that the rigging was insufficient to have a substantial effect on the final result. EC Spokesman Charles Willy Ochola yesterday said: “We are doing this legally and we should be allowed to do (our work) instead of being pessimistic.” He emphasised that no voters cards will be issued within the three weeks left to the polling days. But unless the proposed summit restores the confidence of all interested parties, the country faces the real possibility that the official results released by the EC could be rejected. Police chief, Maj. Gen. Kale Kayihura last week confirmed that they were investigating about 10 known vigilante groups. The Force has, however, repeatedly said that the crime preventers are being trained to help maintain law and order. But the opposition says that these groups numbering 30 individuals per village were recruited from amongst ruling party sympathisers – a claim Ms Masiko denied. WHY DO PROFESSIONALS LEAVE THEIR CAREERS AND OPT FOR POLITICS IN UGANDA? The Principles of Decentralization are entrenched in Uganda’s Constitution and the Local Government Act. These provisions empower Local Governments with responsibilities of allocation of public resources, integrated participatory planning and budgeting, local resource mobilization and investment management within their areas of jurisdiction. The decentralization policy aims at improving service delivery, accessibility to services and reduction of poverty. The reason why people who are well qualified (Medical Doctors, Engineers; to mention some) leave their would be paying professions and opt to compete for Local Government positions can be found in the study below which was undertaken by The Economic Policy Research Centre (EPRC). The Economic Policy and Research Centre (November 4, 2003) presented their study which showed that the private tender system in 6 districts studied that is: Mbale, Kamuli, Mubende, Masaka, Ntungamo and Arua had ‘very serious defects’ and amounted to little more than a transfer of money from the ordinary often very poor tax payers, to the pockets of richer tax collection agents and their associates. “Given that gross profit margins to tenderers vary from between 100% to almost 1,000% in the above districts, the private tendering system amounts to a gigantic rip off,” said Professor Frank Ellise, a Senior Consultant on the EPRC study team. This happens because tax collection contracts for market places, fish landing sites and parishes are tendered out on the basis of an “assessed” reserve price that is supposed to represent the amount of tax likely to be collected from that market or site. Tenderers are usually permitted an “official” profit margin of about 20% above this reserve price. In other wards for an assessed revenue potential of 1million shillings, the reserve price would be shs 800,000. It is in the assessors’ interest to keep the reserve price low so that the tenderers have the potential to make very high unofficial profits on the taxes they collect… profits that can ultimately be shared with corrupt district officials, tender board members and local politicians. The gap between revenue actually collected and the official tender price represents profits of as much as 407% in Kamuli, 558% in Masaka and an alarming 970% in Ntungamo. This money could have been obtained by councils if there was participatory involvement of the people. This situation is very discouraging especially when we consider that it is the poor who are being hurt the most and, in this type of circumstances, because there is a revenue gap in the local governments, the local governments continue to search for new ways to generate higher incomes hence burdening the residents with ever increasing numbers and types of levies, licences, fees and taxes to the point that multiple local level licensing and taxation, and its maladministration, is now among the leading cause of poverty in Uganda. (The Monitor, Monday, November 17, 2003). As a Crusader for Good Governance, I cannot sit back as see MPs degenerate to objects to be used by the NRM Government for agenda they are bound to regret after when they regain their senses after eating shs 20 million bribe. When we say that the NRM Government Expired, we mean it. Those people who set two terms for an average leader were not stupid. We are the ones who degenerate to the extent of bearing no shame even when we do unthinkable things. What the electorate of Uganda ought to do is simple; get whoever has eaten the shs 20 million into retirement, these are useless legislators who will late all rubbish go through because they are enslaved. Our country desires better that expired stuff. If the NRM MPs think it is logical to eat that money and pretent that it was used for NAADS yet when NAADS has people qualified to do the work, the best is not to vote these people because merely eating shs 20m shows how much a liability they have become. If shs 20m is divided into shs 50,000 and given to women with a little skill, such women may be able to earn shs 3,000 from such money and the lives would be better and 400 such women can benefit, yet NRM Government has given this money to bribe each MP beneficiary. If the shs 20m to about 300 MPs were given out in shs 50,000 to women, at least 120,000 would stand to benefit. Let Ugandans not vote for people who are a liability to the future of the country. 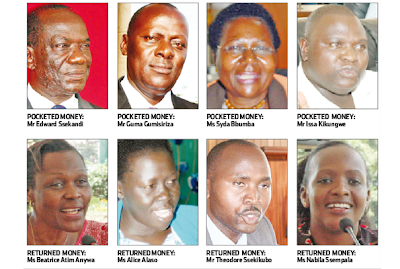 MORE Opposition and NRM MPs have vowed to refund sh20m that was given to them by Parliament. A number of MPs interviewed described the offer as a “bribe” for passing the over sh600billion supplementary budget early this month. 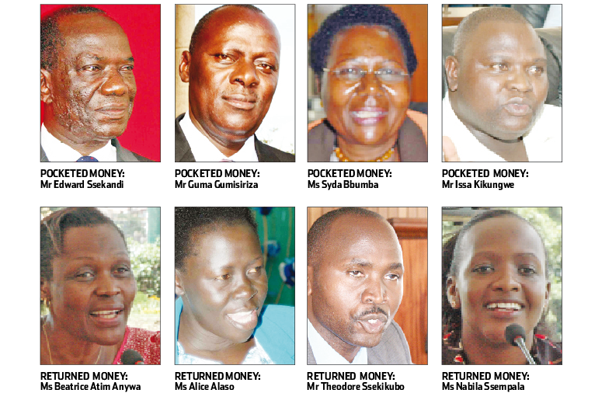 Last week, the Parliamentary Commission paid sh20m to all MPs to facilitate them to monitor government projects. However, the money according to MPs interviewed was taxed, and MPs received only sh14m. Speaking from Terego in Arua district, Opposition Chief Whip Kassiano Wadri said he will return the money as soon as he is in Kampala. “I have not checked on my account for some time, but believe that the money is there. I will return it immediately I come back to Kampala,” Kassiano said. He explained that opposition parties agreed that all their members should not accept such monies. Sources within FDC said they had received an earlier warning from the party’s secretary general Alice Alaso last month not to receive that money. Two NRM legislators have also vowed to return the money back to Parliament. The outspoken, Rubanda West MP Henry Banyenzaki and Winfred Niwaga of Ndorwa East, described the offer as ‘witchcraft, which they believe will cause many causalities in the party. Banyenzaki and Niwaga said that the timing of the money was not good and that the money is a ‘bribe’ rewarded to them in appreciation for endorsing the supplementary budget. “We have been MPs for the last four years, has government just realised that it is necessary to facilitate us? Why didn’t it the beginning of the term of this Parliament? There is something cynical behind this money. I have instructed my bank to send it back to the sender,” said Banyenzaki. Another outspoken legislator, Theodore Ssekikubo (Ssembabule) had not yet taken a decision, but said he will look at the guidelines on how to spend the money, and then take a decision. However, Kampala central MP Erias Lukwago opposed the idea of returning the money, saying that it will be misused by some officials. He suggested that it would have been better for all the opposition legislators to open a pool account to deposit that money and then agree on something else to do with the money. “It is unfortunate that a decision by the opposition has been taken, because I am totally against the idea of refunding that money. There are some many ways of how that money can be put to maximum utilisation,” Lukwago said. He pointed out that since the opposition to which he belongs to had already taken a decision, will refund the money next week. Kitgum Woman MP Beatrice Anywar became the first opposition MP on Thursday to return the money. Anywar while handing over the money to Parliament said her conscious could not allow her spend the money. Parliament Commission on January 15 paid at least sh6.5b to 326 MPs’ accounts. According to payment vouchers seen, the money was paid as allowance to monitor government programmes. Of those who promised to refund the money said they don’t understand which programmes they have been paid for to monitor. MP Yokosi Bwambale Bihande (Bukonjo East-FDC) who also promised to return the money next week noted that since all MPs were busy in campaigns, the money will not be appropriately utilised. “Parliament is ending, all MPs busy in campaign. They will not be free until after election. When shall spend that money on monitoring? How shall safe guard that money given the expenditures during campaigns,” Bwambale wondered. Another MP Elijah Okupa (Kasilo East-FDC) said he had not received his but promised to return it as soon as he gets it. “That was a bribe. Why should I take it? I will return it,” Okupa said. Uganda People’s Congress and Democratic Party whips, Livingstone Okello Okello and Mathias Nsubuga, said they were not aware of the money, but promised to consult their party members before a decision is taken. HOW IS UGANDA’S GLOBAL COMPETITIVENESS POSITION?